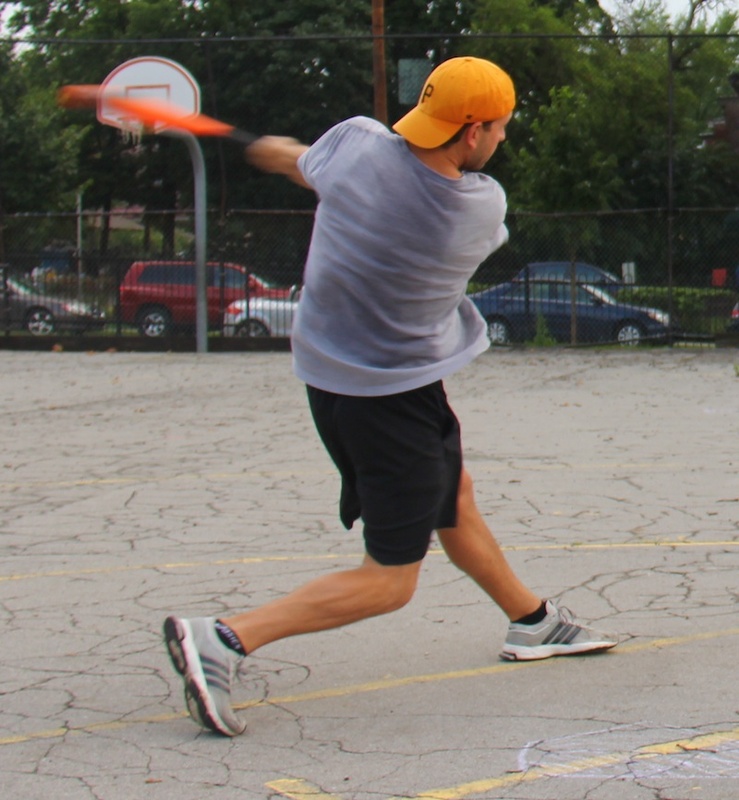 With an 8-2 win over the Ham Slams in week 10, Questionable Outfit clinched the 2013 EWL Pennant and the #1 seed in the playoffs. With two of their key contributors, Bob and Mike, out for the week, Questionable Outfit picked up Reilly Jr. as a free agent and sent Reilly to the mound for only his second start of the season. 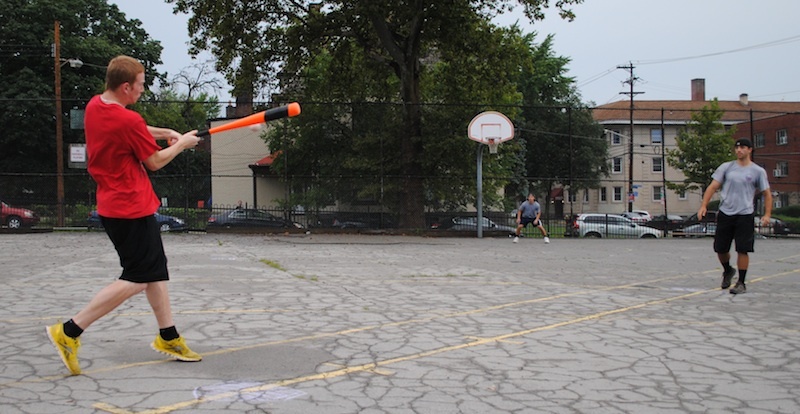 After retiring Kyle to start the game, he gave up a one-out single to Steve. But Reilly retired the next batter, Josh to end the top of the first. Charlie started for the Ham Slams, and he had some difficulties early and throughout the game. Tom led off the game with a double and moved to third when Reilly followed with a single. With no outs and runners on the corners, Reilly Jr. hit a deep fly ball to center field, and Tom scored on the sacrifice fly to make the score 1-0. Tom then singled, putting runners on first and second with one out. Reilly hit a one-out double, scoring a run and making the score 2-0. Charlie then retired Reilly Jr. for the second out, ending the inning and stranding two runners on base. Charlie led off the top of the second with a single. After Kyle flew out for the first out, Steve singled, putting runners on first and second with one out. But Reilly escaped the jam, retiring Josh for the second out, stranding both runners and maintaining the two run lead. Charlie pitched a perfect frame in the bottom of the second, including striking out Reilly for the second out of the inning. Reilly matched Charlie in the top of the third, retiring the side in order. Questionable Outfit got back to work in the bottom of the third. Reilly Jr. led off the inning with a single, and Tom followed with another single to put runners on first and second. Reilly then grounded out to left, advancing the runners to second and third. With one out, Reilly Jr. singled, scoring both runners to push the Questionable Outfit lead to 4-0. Charlie then retired Tom for the second out of the inning. Down 4-0, the Ham Slams got on the board in the top of the fourth when Steve led off the inning with a solo shot, making the score 4-1. Reilly avoided further damage, retiring the next two Ham Slams batters to end the inning. Questionable Outfit would make up the lost run immediately. Reilly singled to lead off the inning, and moved to second when Reilly Jr. grounded out for the first out. Tom came to the plate and crushed a two-run bomb to deep left field, and the score was 6-1. Reilly grounded out for the second out of the inning, and the Questionable Outfit lead was at five runs. Kyle led off the top of the fifth with a solo homer to deep right field, cutting the deficit to four runs at 6-2. Steve grounded out for the first out, and Josh followed with a one-out single. But the Ham Slams couldn’t rally, as Reilly retired Charlie to end the inning. Reilly Jr. led off the bottom of the fifth with a single and moved to second when Tom followed with a single. Reilly grounded out for the first out of the inning, but pushed the runners to second and third. With one out, Reilly Jr. doubled off the wall, plating both runners and making the score 8-1. Tom followed with a one-out double, putting runners on second and third, but Charlie retired Reilly to end the inning, stranding two runners. Reilly retired Kyle to start the top of the sixth, and Steve followed with a one-out single. But the Ham Slams couldn’t come-from-behind, as Reilly retired Josh to end the inning, giving Questionable Outfit an 8-1 win and the 2013 EWL regular season pennant. The win moved Questionable Outfit to 13-6 on the season, while the loss dropped the Ham Slams to 5-13 for the year. – Reilly pitched the complete game win for Questionable Outfit, scattering 7 hits while allowing only 2 runs in 6 innings pitched. – Charlie took the loss for the Ham Slams. He allowed 8 runs on 13 hits while striking out one in 5 innings. – Tom led Questionable Outfit at the plate, going 6-for-8 with 3 singles, 2 doubles, a home run, 4 runs scored, and 2 RBI. – Reilly Jr. went 4-for-7 in his EWL debut with 3 singles, a double, a sac fly, 2 runs scored, and 5 RBI. – Steve led the Ham Slams offensively, going 4-for-5 with 3 singles, a home run, a run scored, and one RBI.